Bob and Sofia from Nature Travels spent a long weekend in Helsinki in August 2017 combined kayaking in the Helsinki archipelago with a short stay in the city. The forecast was not great – rain and wind. The rain isn’t so bad when kayaking as once in the kayak, a little more water isn’t the end of the world, but the wind is a different thing. We took an early morning flight from the UK and arrived at the kayak centre around mid-day. We had a lunch at their cafe and then started to pack the kajaks and bags we were going to leave behind at the kayak centre. 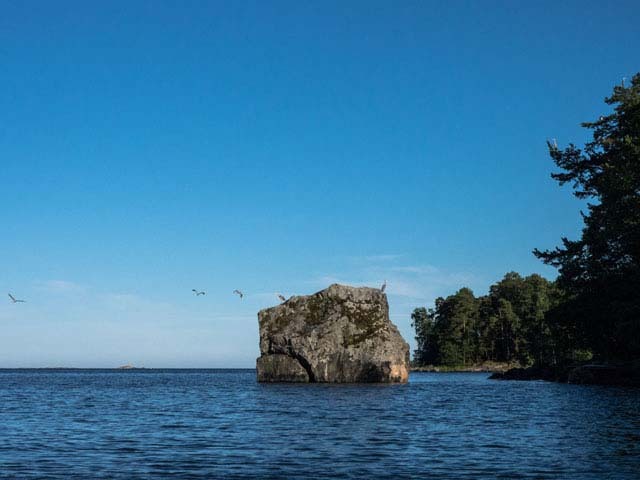 The kayak centre is within easy travelling distance of Helsinki city, yet starting from here brings you quickly out into a beautiful island world. Photo: Nature Travels. At around 3 pm, we were ready. The sun was out and we didn’t seem to get any rain, but it was a south-westerly wind and it was blowing straight into the bay where the kayak centre is. 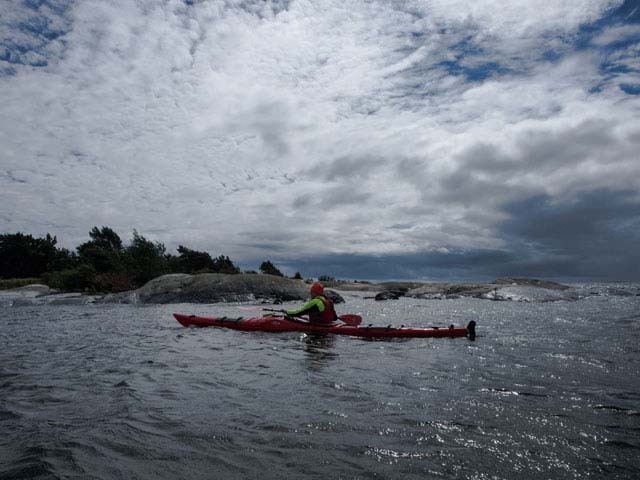 They offered to drive us to the other side of the peninsula where we could start in a more sheltered bay, but as we had Ilkka with us (who is an experienced kayaker and kayak guide), we decided to head out straight into the wind and the waves. We paddled for a few km before we rested a bit in a sheltered bay, then continued to a nearby island with a nature path. We landed to explore and made our way to the highest point, about 25m up (this is Finland – nothing’s that high! 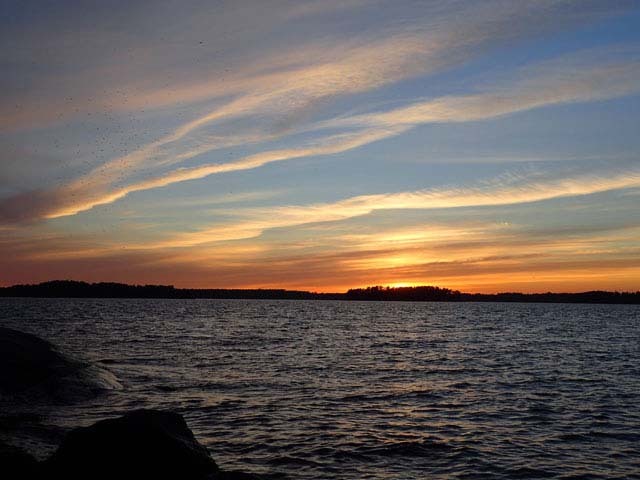 ), which gave us a stunning view over the surrounding archipelago. Our time was our own and we were here to enjoy ourselves, so we decided to take a break to walk the 3km nature trail that leads around the island. 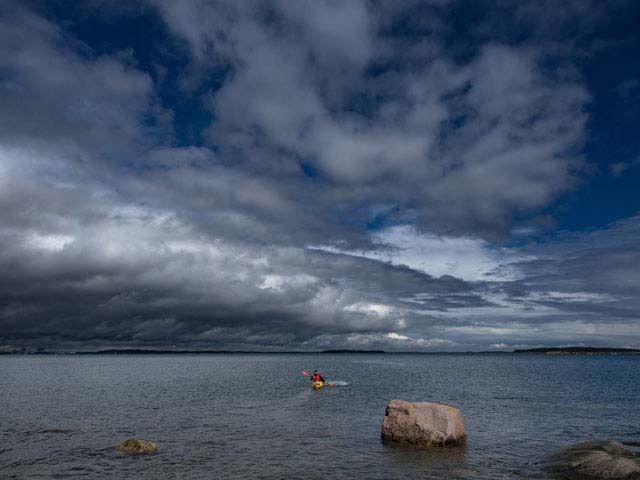 The region offers the option to paddle closer to land taking advantage of the shelter of the islands or, for those with more experience, to explore more open water. Photo: Nature Travels. I’m very glad we did, because it turned out to be fantastic. We came across a series of small “interest stops” with wooded tubes hanging on nearby trees, each containing an information sheet (currently in Finnish only, but an English version is in production) describing what there was to see there – from a stunted pine supposedly hiding a Finnish forest spirit to a magical natural church to postcard-perfect cottages nestling amongst the trees. The whole island felt like stepping back in time to a quieter, simpler age, which was even more remarkable as we discovered when we reached the far side of the island that Helsinki in all its 21st century glory lies literally just 20m or so away across the water, the rowing boats reclining on the beach on our side making a strong contrast with the shiny new boats flitting back and forth across the sound. A gathering of herons. Photo: NV. We learnt that there’s something of a battle underway to protect the island – there’s a plan to site 7000 houses there and connect it to the mainland by subway, which, though nothing is likely to happen for several years yet, would be a tragic loss of a rare and irreplaceable resource. The island is home to rare plant species, has a rich cultural heritage and is simply a lovely place to be. Showing that the island is valued and frequented by visitors foreign and domestic may be a vital tool in the armoury to save it, so when you’re there, make sure you pay a visit! Should the island one day lose its fight, you’ll have had the poignant opportunity to enjoy a remarkably tranquil and remote-feeling area nudged right up against the pressures of the modern world yet still retaining all its charm. All too soon we were back at the viewpoint. We took a last look out across the islands and, as the first tinges of evening came into the skies, took to the water on our way to our island camping spot for the night. We decided on an island a few km away. It was supposed to have a sauna, fireplaces and outdoor toilet. When we arrived we noticed that there were a few boats anchored at the island, but we easily found a private spot and started to make dinner and set up our tent. When setting up the tent we realized that one part of our tent was missing, the roof! As it was supposed to rain overnight we called the kayak centre and they said they would send someone out with it. For dinner we had pasta and smoked salmon sauce and while eating we saw Emil from the kayak centre coming paddling with our roof. We offered him some dinner, before he paddled back again. As this point it was starting to be quite late. 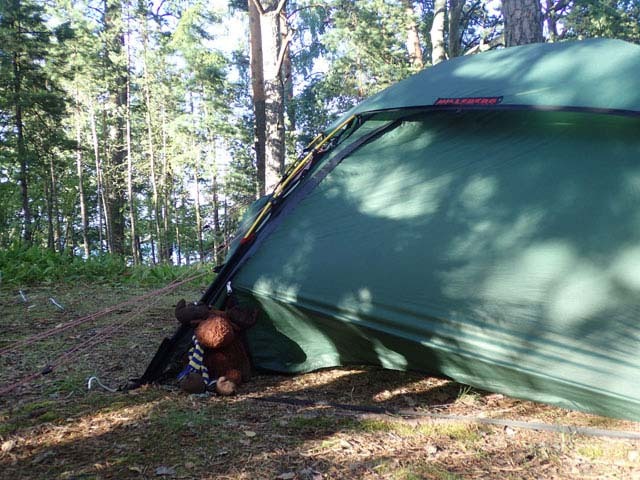 We were contemplating having a sauna, but after an early departure from the UK, the call of the sleeping bags won and we headed into our tents. When the sun finally goes down, the skies can be spectacular. Photo: Nature Travels. In the morning, we woke up to heavy rain on the tent, at first we didn’t want to go out, but then the “call of nature” forced us out. Outside with all the raingear on it wasn’t that bad and we decided to stay outside and eat breakfast. 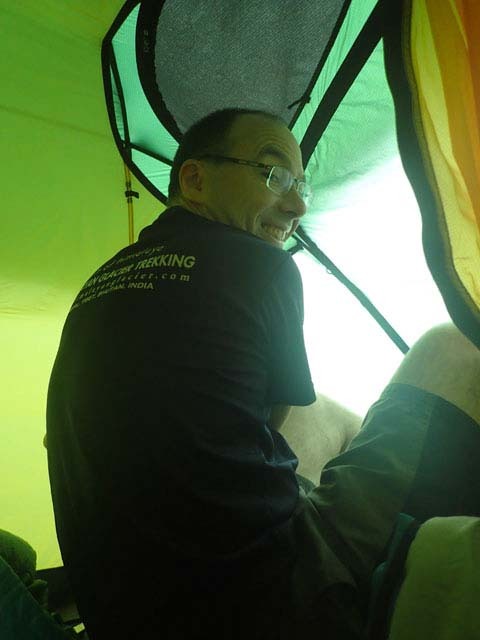 But during breakfast the rain got heavier again and we ran back into our tents to hide! The weather’s terrible! Do we have to go out there? Photo: Nature Travels. Around 11.30 we decided that it was time to stop being chickens and head out, and when we heard the rain ease off, we packed up and loaded the kayaks. Being ducks rather than chickens would have been more useful, and with the benefit of hindsight, we should have stayed in the tent a while longer. As soon as we got out onto the water, the heavens opened again, the wind howled, and we spent the next 15 minutes or so battling a headwind through a brutal downpour than lashed our faces and turned the surface of the water into a crazy tapdance of miniature water-bombs. It was by far the worst weather Sofia or I had ever paddled in, but although we were getting soaked, we had a smile on our faces and were actually really enjoying ourselves. By the time we reached the next island, the wind had dropped and the clouds were beginning to break up to reveal some sunshine and the promise of some lovely weather ahead for the rest of the day. Weather conditions can be changeable, so plan your route carefully and be flexible to take account of wind and weather conditions. Photo: NV. We were skirting an island used by the Finnish military, looking for a tiny channel that would lead through to the more open archipelago beyond. We found it, squeezed through under the small wooden bridge and emerged to see the wide Baltic stretched out before us. Though the weather was much nicer now, it was still windy, and with plenty of time for the waves to build out in this more open water, there was a significant swell. Had Sofia and I been without our guide at this point, we would not have paddled further out, but would have returned to the leeward side of the island, where it was now flat calm, to continue our tour in more sheltered waters. This clearly illustrated not only one of the differences between the experience of a self-guided and guided tour, but also the enormous difference in level of challenge and paddle conditions to be found by varying the route even just a little. Self-guided is a wonderful way to go, offering the flexibility and adventure of planning your own trip, but at the same time, having a guide adds a whole different dimension to the experience, not only in terms of learning about the area in which you are travelling, with its natural and cultural heritage, but also allowing you to improve and develop your technique and, as we did now, strike out to try something rather more challenging than it might be sensible to attempt on a self-guided tour. The archipelago area feels surprisingly remote considering you’re just outside Helsinki city. Photo: NV. And so with Ilkka by our side, we ventured out into the rollercoaster swell. I have to confess I had to put my game face on at this point, as this was a bit outside my comfort zone. 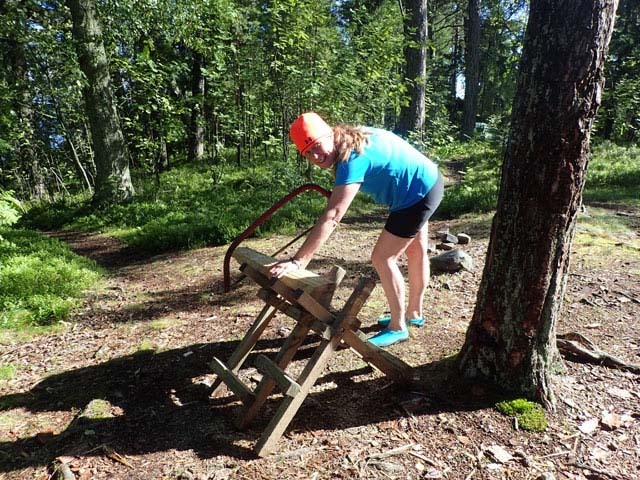 But a few minutes in, I’d relaxed and found my balance and was enjoying myself almost as much as Sofia (who had the luxury of growing up in the Stockholm archipelago compared to my more landlubber upbringing! ), even chancing a bit of kayak surfing on the waves as we rounded a small, flat island renowned for its nesting birds to come to rest for a while beside a lovely beach. We had a bit of a breather in the lee of the island, before we continued to the next one, where we decided to go ashore and have a look what facilities there were and also have a little break. By this time the skies had cleared and we had full sunshine and blue skies. Enjoying a cosy evening by the fire is the perfect way to end a day’s kayaking on the water. Photo: Nature Travels. After our short break we paddled onwards to the island where we were planning to spend the night. We thought we would put up the tents, have lunch, unpack the kayaks and then go for an evening paddle. We landed in a small bay next to another two kayaks and went exploring. We found the tent of the owners of the kayaks but there was no one there. We continued exploring and then found two of our guests, Adalbert and Leonardo, sitting at the shelter warming themselves next to a fire. We quickly said hi, then proceeded to set up our tent in a sheltered spot we found and started to cook lunch. At this point it was time for Ilkka to head off home, so we said bye and said we would speak next day when we got back to the kayak centre. I prepared some wood to keep the fire going and Bob went for a swim (brrr, I choose to watch). Then we changed into dry clothes and warmed up by the fire and had some mugs of warm tea. It was now late afternoon and if we were going to head out again, we should start thinking about getting ready. But we were so comfortable there in front of the fire that we decided to skip it – we deserved an afternoon of enjoying the fire, we thought! 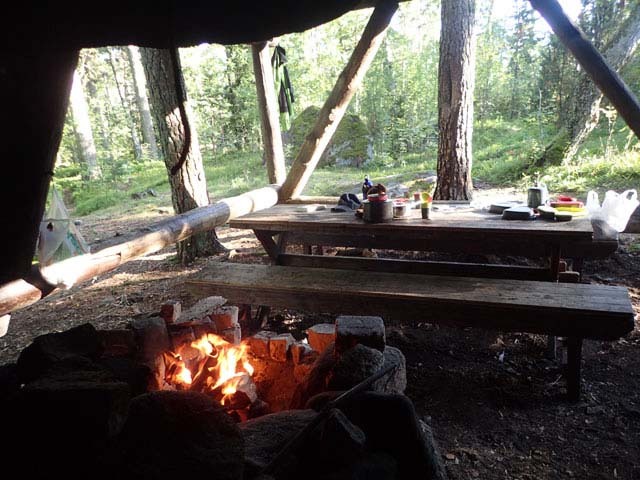 There is a wonderful network of camping spots, where wind shelters, fireplaces and firewood await! Photo: Nature Travels. After dinner we settled in front of the fire and after while Adalbert and Leonardo came and joined us and we had a great chat about life in general. Darkness fell and it was time to hit the sleeping bags. We wanted to head off early, but decided to chance it and not set any alarms. It was a lovely spot to camp, and we’d really enjoyed the chance to spend some extended time on the island the day before. This again illustrated an important point – the kayaking is of course wonderful, but it’s by no means just the time out on the water that is the fun part of a trip. The experience of camp life, lighting your fire, cooking dinner, chatting and taking a swim (my swim was extremely short, by the way – a change in wind direction had rapidly made the water rather colder than I’d thought it would be!) – all these are just as much a part of the experience as the actual paddling. Elky accompanies the Nature Travels team on many of our outdoor adventures. Photo: Nature Travels. But all too soon our time in the archipelago was coming to an end and a day in Helsinki lay ahead – we took down the tent, packed the kayaks and pushed off for the short paddle back to the kayak centre beneath beautiful blue skies. Once back, we cleaned off and organised our equipment, said our goodbyes and headed off. The walk to the metro station is only about 20 minutes, so with the sun still shining it seemed unecessary to take the bus. Soon we were zipping our way back into town on Helsinki’s very clean (and very affordable – just €3 for the ticket into town) metro, and 30 minutes later we emerged blinking into the sunlight at Helsinki central station. 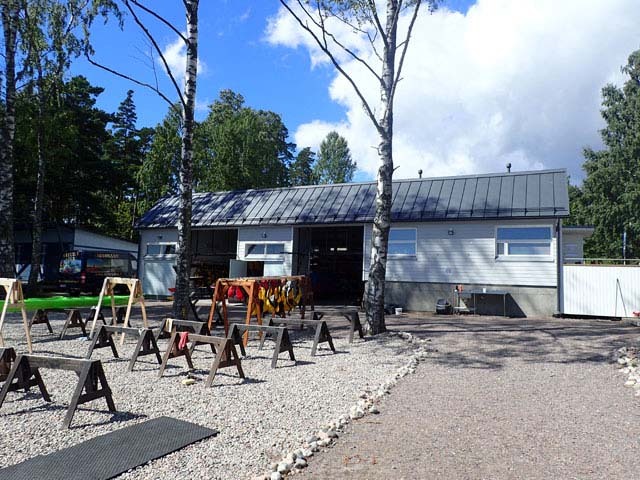 The day was our own until 6pm, when we had a meeting, so we checked into our hotel (Hotel Helka – which we’d recommend – about 20 minutes walk from the central station and a friendly and environmentally conscious choice) and set off to explore the town. 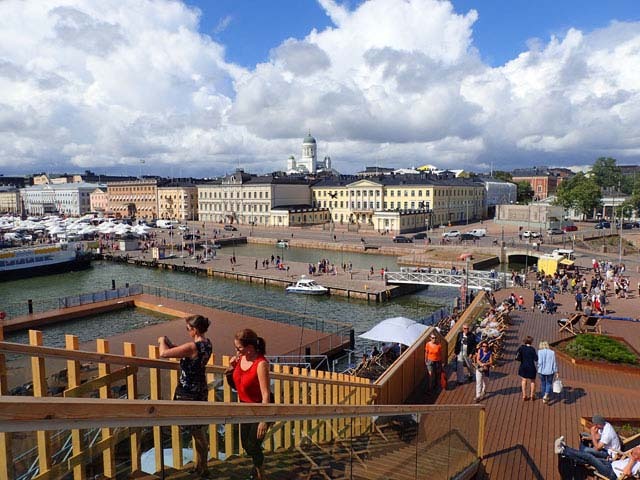 The public bathing area in Helsinki is a wonderful place to people-watch and enjoy the sun. Photo: Nature Travels. Just as it had been during my last visit, Helsinki was showing its best side today, with the wind still blowing but the sun shining. We took a stroll down through the Esplanade, thick with picnickers and buskers, towards the buzzing Market Square down by the harbour. Since I’d last been in Helsinki, they’d completed a lovely public sun terrace and open air swimming pool right on the quay, so we spent a happy half an hour or so reclining in one of the sun loungers, sipping orange juice and watching the very fashionable Finns enjoying the day. 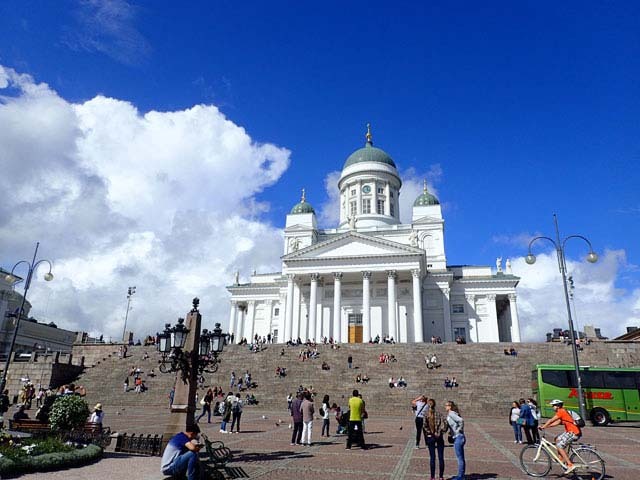 Exploring Helsinki cathedral. Photo: Nature Travels. As evening drew on, we met up with Joose, another of our local partners, for dinner at the Empire Plaza Chinese restaurant (which was very nice indeed, especially for starters and main course, not so much for desserts) to discuss packrafting and ski touring before retiring to enjoy a comfy bed. With an early start we had no chance for a luxurious hotel breakfast, so breakfasted on camping leftovers before walking to the station. Another change since my last visit was the completion of a rail service out to the airport, and now trains run regularly from the central station, again for a very reasonable €5. It had been a short but varied and really enjoyable trip. The possibilities for some top-quality kayaking and camping so easily-accessible from the city was remarkable, and as the plane left the runway at Vantaa I was already wondering when I might next be able to return. 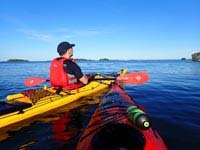 Nature Travels offers both self-guided kayaking and guided kayaking in the Helsinki archipelago.